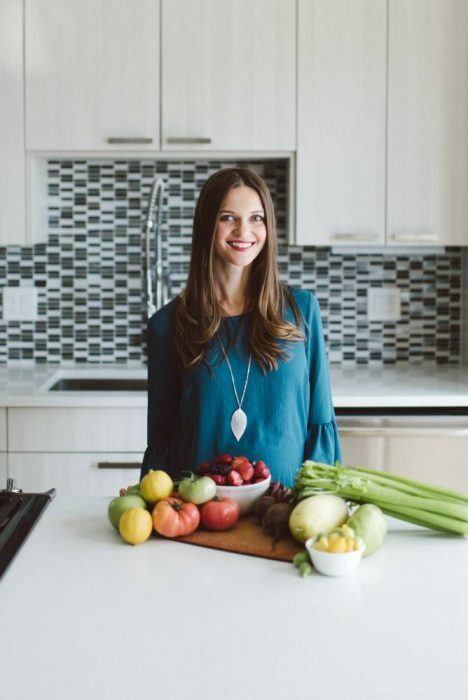 Hashimoto's Food Pharmacology with Dr. Izabella Wentz - Dr. Nikolas Hedberg, D.C.
Dr. Hedberg: Well, welcome, everyone, to “The Dr. Hedberg Show.” This is Dr. Hedberg, and I’m very excited today to have my good friend and colleague Dr. Izabella Wentz on the show. She has been on the podcast before, and I am excited to have her on today. So, Dr. Wentz, thanks for being on. Dr. Wentz: Thank you so much for having me, Dr. Hedberg. I’m a huge fan of your work, and it’s an honor to be here with you. Dr. Hedberg: Great. So for those who don’t know about you, why don’t you just tell everyone a little bit about yourself and what you’ve been working on and your new book that’s coming out? Dr. Wentz: Sure. So, I’m a pharmacist by training and, in full disclosure, I wasn’t interested in the thyroid until I became diagnosed myself with Hashimoto’s after almost a decade of some pretty confusing symptoms. So I had fatigue, and I had pain all over my body, acid reflux, hair loss, brain fog, and you pretty much name the thyroid symptom, I had it, but it had gone undiagnosed. I was a pharmacist and was super excited about taking medications for my thyroid once I found out that I had a thyroid condition, but unfortunately they only helped a tiny bit. At that point, I realized there was something else going on in my body, and I wanted to figure out if there was anything I can do to help myself, one, feel better and two, potentially reverse the condition, and that’s sort of how I became a Hashimoto’s expert/human guinea pig was really through my own journey with Hashimoto’s and having a lot of different symptoms that nobody seemed to be able to solve. My official bio is that I am an author of multiple books on Hashimoto’s. One of them is “Hashimoto’s Thyroiditis: Finding and Treating the Root Cause.” This was published in 2013. And then “Hashimoto’s Protocol: A 90-Day Plan for Reversing Thyroid Symptoms and Getting Your Life Back.” So this has been really my life’s work is to help people with Hashimoto’s take back their own health. After being able to do so myself, I have a brand new book coming out, “Hashimoto’s Food Pharmacology.” And this is really focused on nutrition, nutrition protocols, and then healing recipes to help people really kind of do it themselves. 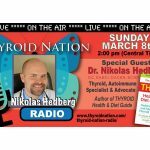 I know that there is a lot of forward movement for thyroid health in the world of functional medicine, but not everybody has access to an excellent functional medicine provider like Dr. Hedberg, for example. And there is a lot of things that people need to do in their own day-to-day life to take back their health and part of that is nutrition. So my new book is focused on helping you take back your own health and being your own nutrition guru when you have Hashimoto’s. Dr. Hedberg: That’s fantastic. So most of my listeners have Hashimoto’s. So, for those who don’t really know that much about it, can you give us kind of an overall view of what exactly Hashimoto’s is, and all the different statistics related to that? Dr. Wentz: Sure. So Hashimoto’s is probably the top autoimmune condition, the most common autoimmune condition worldwide. For those that don’t know what it is, it’s actually the immune system starts to recognize the thyroid gland as a foreign invader and begins to launch an attack against the thyroid gland, and this eventually leads to the thyroid gland not being able to produce enough thyroid hormone. And it really goes along with a lot of different symptoms. So people will have problems with brain fog, they’ll have problems with weight gain, they’ll have problems with fatigue, a lot of times they’ll have hair loss, cold intolerance. And really when we think about what the thyroid does is it generates heat and energy within our bodies, and dictates the metabolism throughout our entire body. So anything could be affected whether this might be, you know, loss of hair from our scalp or cold extremities or potentially having easy bruising on the skin because we’re not…our metabolism isn’t working properly. These are just some potential thyroid symptoms. Looking at the statistics, we seem to have more and more cases of Hashimoto’s every year. It’s not just because we’re diagnosing it more, it also seems to be more prevalent. You know, different statistics are out there, anywhere from one in three or, you know, one in five women may have this condition at some point in their lives. Dr. Hedberg: Yeah. So there’s 300 million Americans, I believe, at this point and about 35 million have Hashimoto’s so that’s huge, and probably more than that, like you said, because a lot of these women and men go undiagnosed. So as you said, you have Hashimoto’s and so I’ve read your books and you have this journey that you went through. There’s probably people listening who are kind of in the beginning of that journey, or in the middle of it, so can you talk about what you went through and, you know, your signs and symptoms, the diagnosis, and the treatments that you went through? Dr. Wentz: Wow, yeah. So I started off having symptoms, you know, the further I look back, probably as early as, you know, three years old, I started having panic attacks. I was exposed to Chernobyl when I was living in Poland, that’s where I grew up. And then kind of things calmed down again until about puberty when I started having a lot of symptoms of depression. My mom was a pediatrician and she thought there was something going on with my thyroid, but we went to have it tested, and everything came back normal. I kind of was always one of those kids that intended to be a bit moody. Until I was about 18, I ended up having a Epstein-Barr virus in my first year of undergrad. And after that point, I just could not get out of bed for months, I was exhausted. And that kind of started off my thyroid journey, the official journey for trying to seek out what was going on. Because the things prior to that were, you know, stomachaches and they were maybe some moodiness, but I just thought that was a normal part of being human. It wasn’t, you know, until I started getting the fatigue and that was followed by irritable bowel syndrome, eventually acid reflux, hair loss, palpitations, panic attacks, let’s see what else, carpal tunnel in both arms. I had all of these different things kind of “small annoying things that were just breaking my body down,” I started to look for answers and trying to figure out, “Okay, what is going on with me, why am I like this, why do I have to sleep 12 hours when everybody else can, who is my age can sleep for seven to eight hours and be bright eyed and bushy tailed, and why am I losing hair, why am I always so cold?” And that eventually led me to figure out I had Hashimoto’s through going to numerous doctors and asking for different tests. And I started on thyroid hormones which I thought were gonna be, you know, my cure-all, right? And within a few weeks, I started to feel better slightly, so I only needed one sweater instead of two sweaters in Southern California. And then I was able to sleep for, you know, 10 or 11 hours instead of 12, so that was an improvement, but then I still had the carpal tunnel, but I still had acid reflex, IBS, and all of these other things going on. And I really just started to peel back the layers one by one. I was a research pharmacist for people with the rare conditions at the time, and I was helping these people take back their health through some unusual means that weren’t part of the standard of care, spending a lot of time in the research world, and decided to do the same thing for myself. And I have tried a lot of different things, some of them were scary and silly, some of them didn’t work. Coconut oil did not cure my thyroid, unfortunately, but the things that did work were gluten and dairy removal. Within three days, I was able to eliminate the carpal tunnel syndrome, the irritable bowel syndrome, and all of the bloating and the acid reflux. And I had those conditions for, you know, anywhere from, like, 1 to 10 years. And so that was a really, really big component of what helped me. I eventually went on to treat some infections that I had in my gut and reactivated Epstein-Barr virus, and looked at toxins and just did a whole body makeover through functional medicine, but really the corner store of what got me to heal was focusing on my diet and nutrition. And it was simply removing some things that were not working for my body and then adding other things that my body was deficient in. Dr. Hedberg: Right, right. Yeah, that’s an interesting journey that you went through and you got everything in balance. And then you wrote your first book and then your most recent book is “Hashimoto’s Protocol” and that was a, it’s a 90-day plan for getting better. A lot of people get better following that. A fair amount of the new patients that I see, you know, they’ve read your work and they’re already doing better just following that. But now you have another book, “Hashimoto’s Food Pharmacology.” And so this is focused more on food and the term we use is “food as medicine,” and how did you, you know, come up with this idea of writing a book just focusing on food pharmacology? Dr. Wentz: One of the big things is, you know, one of my big goals and I have a bit of an eclectic background as a pharmacist, what I worked in, a bit of consulting research as well as public health and really looking at how do we get this information out to people so they can help themselves. And, you know, I feel like to really impact healing in a big way, we need to educate the practitioners and we need to educate the patients, and everybody should be empowered. There are certain things that people can do on their own such as change their diet and nutrition and change a lot of their inputs, and there are some things that they need to do with the practitioner. Lot of times, it’s treating the infections and toxins unless they’re, like, super biohackers, then, you know, a lot of times we’re gonna want to work with practitioners. But I love the idea of giving people the tools they can utilize on their own, so they just can go to practitioners to tweak things. With food pharmacology, my whole kind of concept and thought process is people expect medications to be a cure-all, they expect just this one pill to completely change all of the messaging in their bodies. You know, our bodies are a complex system of different neurotransmitters and hormones and different messages that get sent all around. And a medication is gonna send out some messages and, you know, some medications are problematic and not appropriate but other medications are greatly beneficial and send out healing messages like thyroid hormones, low-dose naltrexone is another one. But if we just have these two healing messages and then we’ve got all these other messages, for example, if you’re eating gluten, your body is not reacting well to that, that’s gonna send an inflammatory message to your body. If you don’t have enough of a certain nutrient, that’s gonna prevent your body from producing anti-inflammatory responses. And really the basis of pharmacology is how different substances interact with our bodies. And so what I’m trying to do is give people a way to basically flood the system with healing messages, and that’s what food does and that’s what nutrients do. They can give our system all these little tiny messages, right, to heal in very, very simple terms. That’s the concept behind it. Dr. Hedberg: Yeah. There is a lot of different diets out there. I would say the most popular one for Hashimoto’s is, of course, the Autoimmune Paleo and, you know, sometimes that works, sometimes it doesn’t, then there are other diets that people are promoting. But I think the most important thing is really the individual foods in a lot of people rather than the diet, so why don’t we give our listeners some specific foods that you think are especially helpful for those who have Hashimoto’s? Dr. Wentz: For a lot of people, the two big foods that are really easy to introduce into the diet and that pack a lot of nutrient density are gonna be green smoothies and bone broth. Like I said, I have a bit of an outcomes research background and public health background so I get a little bit nerdy, and I used to try to collect all of the outcomes and things that worked within my clients, and then I eventually started doing that for my readers. And 68% of people have said that they find green smoothies to be helpful. So 80% of people will say that they give them more energy, 60% will say their mood improves, and 40% will notice benefits for weight. And this is quite impressive, because these are some of the top symptoms that people complain about when they have a thyroid condition, right, when they have Hashimoto’s, and just introducing a green smoothie into your life can do that. Now, one of the reasons is because this will help to increase our intake of nutrient-dense foods so we’re gonna utilize lots of great veggies and we’re gonna chop them up really nicely so they’ll be easier to absorb. And then also it’s gonna give us a break from digestion so our bodies are not gonna need to spend all this energy on digesting. And just so everybody knows, the green smoothies I recommend are not like, you know, like, they’re not full of sugar. I’m recommending using maybe four to six different types of veggies like celery, carrots. Avocado’s a fruit that, we can utilize that and maybe a serving of berries with potentially, like, a coconut milk base as well as a clean protein powder. And that will keep our blood sugar stable throughout the day, that’s to be utilized for breakfast every morning. People will say they feel significantly better just with that little addition. And it’s wonderful because you throw everything into a blender, and you can be out the door, you don’t have to spend, you know, hours cooking your breakfast. And then bone broth, bone broth has collagen and various types of nutrients to support the gut lining, support the skin, support the hair. Seventy percent of people have been with Hashimoto’s will say that adding bone broth into their diet, they see noticeable results. So they’ll say they have more energy, that’s about 60%, about the same will see an improvement in mood and about 30% will see an improvement in hair and skin. We also have a subset of people who will say like, “Oh, wait, my joints don’t hurt as much.” And so this is something that for me, you know, I don’t spend a lot of time cooking nowadays that I have a little child to take care of, but you can just throw in some carrots, celery, onion, and maybe apple cider vinegar with some bones or chicken drumsticks, top it off with some water and let that cook in a pressure cooker or slow cooker while you do something else. And then just add some sea salt to that, and sip on it throughout the day. It’s super, super easy. Doesn’t require you to be a, you know, a professional chef, doesn’t require you to spend your entire day in the kitchen. Dr. Hedberg: Excellent. Yeah, those are definitely two of my favorites, and then they can add the protein powder to the green smoothie, and the bone broth has some pretty powerful gut-healing nutrients. So those are some great recommendations, and also the thyroid is so heavily dependent on minerals so they’re gonna get some extra minerals from the bone broth. Dr. Hedberg: So what about foods like gluten, dairy, soy? You talked about, you know, gluten and dairy made the biggest difference. When I’m working with a patient, sometimes we’ll go, you know, into like a full elimination or Autoimmune Paleo type diet right away. If they’re under a lot of stress and a diet just seemed like it’s going to cause a lot of problems and more stress, then I’ll usually just start with, say, gluten, dairy, and sugar. But those three, gluten, dairy, and soy, do you have any…how do people replace those, and what are some of the best foods out there to replace those? Dr. Wentz: Sure. And yeah. We always wanna make sure we’re meeting the person where they are. And some people, and that’s why I have three diets in my cookbook, I have the gluten-free, dairy-free, and soy-free diet as a starting point. So people can step up with that diet and they can remove more foods if they need to, or they can start with something like the Autoimmune Paleo diet and then they can add more foods. And, you know, everybody is gonna be a little bit different. They’re gonna have different levels of what’s comfortable for them, and that’s okay. I know for some people saying they have to do the Autoimmune Paleo diet, they may delay their healing for years because they’re not quite ready for that. But if you’re like, “Okay, let’s just take out, let’s just swap out some of the coconut milks for regular milk,” that might be an easy thing for people to do where they just remove a potentially inflammatory food for them. And so I love that you give people those options and, you know, you kind of meet people where they are, too, because I think that’s a really important thing to honoring yourself is seeing where you are. Some of my favorite kind of replacements for, let’s say, gluten-containing products and there’s different categories depending if you’re doing autoimmune or Paleo or Intro and I go through a lot of these in the cookbook. But for the autoimmune diet, cassava flour is amazing, so cassava flour can be used for baking. I have an autoimmune berry pie in the cookbook that’s just with cassava flour and no other kinds of flours and that’s autoimmune friendly. It can be pretty much replaced one for one with regular flours in a lot of baked goods and recipes. And then let’s say if you’re doing spaghetti, I like spaghetti squash, is gonna be a wonderful alternative for autoimmune. For Paleo, if you’re doing that type of diet, almond flour is an excellent choice for a lot of people unless, of course, they’re almond sensitive, then that would not be a great choice. And that’s, you know, you can bake fantastic muffins with that, you can make various types of even cheeses if you’re avoiding dairy products, you can make cheeses with almonds. If you’re just on a Intro diet, you have a lot more options at that point. You can use things like oats, you can use buckwheat, you can use quinoa and there is a lot of potential, you know, there is a lot of ways to make different types of breads and pastas and baked goods without gluten. For dairy, one of my favorite go-tos is gonna be coconut milk. So you can make coconut milk yogurt, you can make coconut ice cream, you can make various coconut oil instead of butter. It can be a bit of an acquired taste at first but eventually, you know, within a week or so, your taste buds are gonna adjust and you’re not…some people are like, “It’s too tropical tasting.” But if you have it just for five to seven days, you will be able to adjust and a lot of times, the extra virgin ones will take care of that for you. Yeah, and then, you know, I think it’s kind of funny. Because people ask me for soy replacements and I’m like, you know, like, “Who’s looking for a tofu replacement?” Nobody is like, “Oh, my God, I love tofu so much, what can I eat instead of tofu?” right? But, with soy, the biggest thing is looking at either almond milk or coconut milk, and just really trying to avoid those processed foods. Dr. Hedberg: Excellent. So, we’ve gone over some of those foods and some of the replacements that people can use, and let’s get into a few of your favorite recipes. So this is something that I think will help a lot of people. Obviously, there’s cookbooks out there and your books, but let’s go over some of your favorite recipes that people will like. And also for people who are looking for foods that…because a lot of people when they go, you know, gluten-free and remove these things, they’re worried that it’s not going to taste good or that, you know, friends and family might not like it as well. So can you go through some of those for us? Dr. Wentz: Sure. One of the strategies that I did, and initially when I started my journey with food as medicine is, you know, I don’t talk about it often, but I used to be quite the cook and quite the baker and so I would oftentimes have dinner parties and I would bring in a lot of foods to work. And, you know, I was a big-time foodie and everybody would always compliment me on my cooking. And when I wasn’t eating gluten and dairy, it became kind of tough because it was a big part of my identity that went missing. So I really had to find a way to reinvent that part of myself, and get more creative with different foods and figure out what I can eat myself and what I could serve to lots of other people to at the same time. And so a lot of the recipes you’ll find are gonna be traditional recipes that are either naturally gluten-free and dairy-free or can be really easily modified so that you can serve them at dinner parties and people won’t even know, right? One of them I have is paella. So the traditional paella is actually gluten-free and dairy-free, and it’s so easy to make. So you cook up some rice and you mix up a bunch of different things that, you know, maybe some seafood, maybe different types of preservative-free sausages, peas, peppers, saffron is the key ingredient here. You mix that up and then you bake that with the rice, and it can be really, really easy, serves a big party of people, that’s a great place to start. Carnitas, my husband makes excellent carnitas, and these are these are very much crowd pleasers. So this is boneless pork shoulder and you can make that in the oven and make a whole big batch of it. And you can make tacos with it, you can eat it by itself, you know, it’s quite versatile. These are some of my favorite recipes. Then I have some Polish recipes and Eastern European recipes that were inspired by family members that I’ve modified such as stuffed cabbage rolls, and then we have bigos, which is Polish Hunter’s Stew as well as galaretka, which is kind of like a secret healing recipe for the gut because it utilizes bone broth and gelatin all at once, and some people have described it as kind of like a chicken soup that you can take with you everywhere that’s portable. And, of course, I have a lot of different desserts. I wasn’t initially planning on doing desserts in the cookbook, but I was pregnant at the time. And so I thought, “Okay, we definitely need to add in some of my favorite desserts in here.” And so we’ve got autoimmune-friendly deserts such as the berry pie that I talked about with cassava flour, and various types of muffins and crepes and pies that you can utilize that are not gonna send your blood sugar all over the place, and they’re gonna be a fantastic complement to your healing diet. Dr. Hedberg: Excellent. Yeah, these sound really, I mean, even if somebody didn’t have Hashimoto’s, these recipes sound amazing. And I think one of the most important things in getting well, I know it’s difficult when people are feeling down, but it’s important to have some level of excitement about your healing journey. And I think this is a book that can definitely create some excitement. A lot of the food is probably gonna be tasting, you know, much better than what people were eating before even when they were eating gluten and dairy and all these other things. So, I’m excited about this book coming out, and I think it’s gonna help a lot of people like your previous books. So how would you like people to find you online? Can you give everyone your website, any social media handles and things like that? Dr. Wentz: Sure. So my website is thyroidpharmacist.com. And then if people wanted to go to thyroidpharmacist.com/gift, I’m giving away some recipes and a couple of guides. One of them is on nutrients so how to utilize nutrients to address some of the deficiencies that we might have, and that can help address a lot of symptoms that are pesky, right? And then my books can be found on Amazon or wherever books are sold. 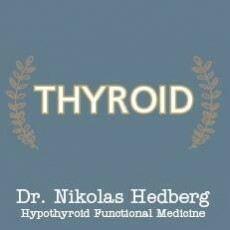 I also have a Facebook page if you look up “thyroid lifestyle,” if you look up “Dr. Izabella Wentz,” “thyroid pharmacist,” you’ll be able to find me. I’m oftentimes on there just connecting with readers and offering little tidbits here and there. Every now and then, I might pop up and do a Facebook Live just to say hello and answer any questions. Dr. Hedberg: Fantastic. Well, thanks for coming on, Dr. Wentz. I really appreciate it. Dr. Wentz: Thank you so much for having me on, Dr. Hedberg, and thank you for the work you’re doing in the world. I really appreciate it. Dr. Hedberg: Thank you. Yeah. So everyone listening, I highly recommend Dr. Wentz’s books and this new book. And go to drhedberg.com for all the show notes from today. And I’ll have links to Dr. Wentz’s website and her new books, and all the things we talked about today. So thanks for listening, everyone, take care. This is Dr. Hedberg, and I will talk to you next time.